The much anticipated (for me at least) launch of the Benro Geared Head happened at The Photography Show, here in the UK back in March. And thankfully, I was one of the first to get my hands on the product. Since getting into architecture and location photography back in 2013 I have always had a fascination with getting my images straight, something that I find incredibly frustrating to do using a ball-head, or god forbid a 3 way pan head. So back in 2015, I purchased a Manfrotto geared head to attach to my brand new Gitzo carbon fibre legs and I was super excited as at last my dream would be realised. That was until I found out the weight of the thing, it was and still is an incredibly heavy piece of kit, especially as a travel photographer. Worse still roll on 6 months and I was on to my third Junior 410, yes third. Tripod heads are supposed to be solid and fixed, but on all of these models there seems to be a “rocking” when you put a small amount of pressure onto the camera when it is fixed into position on the head, strange right? But that is not all – the mechanics are weak, on my second and third versions the release pin snapped off in my hand. This guy must be super heavy handed, you must be thinking? Well no, it turns out my friend Adam (who also bought the same product just weeks before I had) had similar if not worse issues. I seem to recall a day when we were out photographing together and upon releasing his plate and camera from the head the whole clip and tightener just fell off and with that you could say that our dreams of straight shots were shattered. I had reverted back to a ballhead within my tripod set up by November 2016 and had all but given up hope of getting hold of an affordable geared head (Arch Swiss do an option, but it is priced at about £1000). However, back in late December 2017 I heard a little rumour of an upcoming release by Benro but I would have to A. be sworn to secrecy and B. have to wait until The Photography Show in March 2018 to get my first look at it. When going to a photography show or trade fayre you have a list of things that you wish to do, talks that you wish to attend etc. 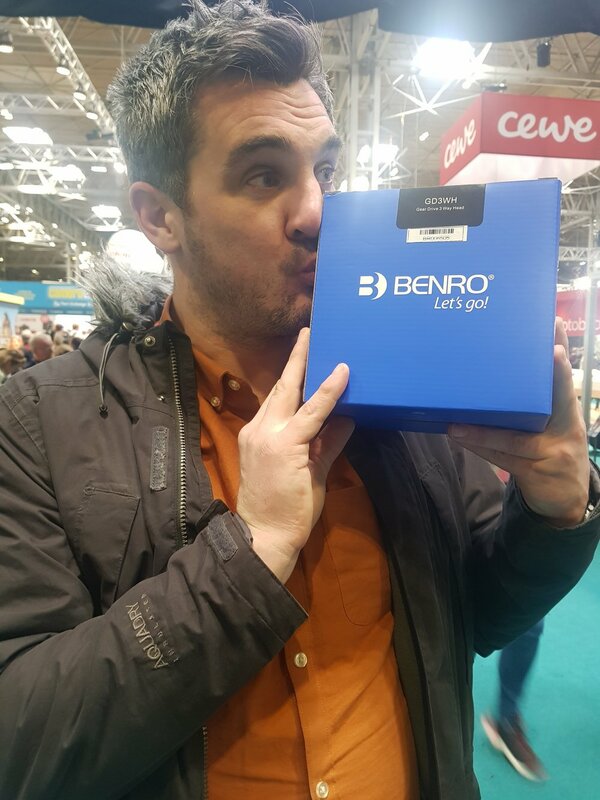 Going to discuss, view, hold and play with the new Benro product was high up on my list and it was placed in said list straight after watching Thomas Heaton talk on the new Adventure stage. Wow was my first reaction, minutes after arriving onto the Benro stand and making a beeline for the product. I proceeded to unscrew it off the podium that it was displayed on, getting a feel for the weight for the first time and I was over the moon, it was so lightweight. With the type of photography that I strongly believe that I can really test a product out. Take a photography bag for example, I throw them through windows and doors, onto floors of abandoned buildings as I shoot and pack them to the brim - as I love taking as much gear as I think I will need when on any trip. So I asked the guys at Benro if they wouldn’t mind me taking one away to test and use on my upcoming trip to Georgia and Abhkazia (series to follow here and on the Benro blog) – and I got lucky as they had a couple left in stock. Upon arriving home from the Photography Show, I moved on to packing for Georgia (which was a superb trip, but that is a side note) and placed my new geared head on its legs for the first time, producing a little "unboxing" story at the same time for my Instagram following. As you have likely seen, yes I am a Benro Pro Partner but this by no means makes me believe in a product, nor for that matter does it make me love a particular product or even want to use it. In fact, I have been known to write emails to brand product teams on numerous occasions now to rant about something that needed improvements and I shall continue to do so because I believe that I put products through their paces – I don't just parade them on a table whilst recording a Youtube video for example, I test them properly. I always place my tripod head into my photography bag when travelling on an aircraft and the legs into my hold luggage. My idea here is that the head usually weighs a lot and I don’t want to use up loads of my 20kg and my hand luggage never gets checked for weight, so my camera gear and heavier kit tend to fall into my hand luggage when packing. However the geared head weighed nothing (Just 870g according to the Benro) and although it was a little awkward to fit in-between one of the dividers on my Tenba Shootout bag it actually reduced the weight of my kit overall (As I took out my old Benro G2 Ballhead). Our first day in Georgia was superb, a real mix of abandoned architecture and history, each building with its own unique styles and challenging shooting angles, however the geared head lived up to my own personal hype. Firstly, there was no rocking and no flex when my camera was mounted – it was solid, rock solid. I also loved the fact that Benro decided to produce this product with an Arch Swiss style mount (the product comes with a blue plate for camera fixing) because I love using an “L” bracket, this is so that I can switch between portrait and landscape modes quickly and line up shots easier doing so, as an L bracket keeps the centre of my camera over the centre of my tripod. With Benro including this, it meant that I could simply slide my L bracket into the mount and tighten it up with ease and little fuss. All of which makes my life easier and it ensures that I can concentrate on my photography, not “how to” get my kit into position for the shot. The geared head is of solid construction, with solid handles and degree increment markers as well as three little spirit levels that are neatly placed on the top and sides of the product. You can obtain precision movement in all three axes using the adjustment handles which allow for miniature adjustments and larger movements can be made by disengaging the gears and twisting the second part of the handles, a familiar design to me. The plate and clamp, as mentioned are the all-important Arca Swiss style with the clamp operated via a twist release style pin and the weight capacity is 6kg (a full 1kg more than the Manfrotto that I previously owned). Moving through the trip and the geared head became second nature to me all over again, as I rattled off shots over each of our nine days in East Europe, even unscrewing it on occasions from the legs to place it back into my rucksack (on our border crossing for example). The geared head lived up to my expectations and had become a joy to use and combined with my Mach 3 tripod legs – it is now not only an essential piece of kit to me but at £200 is a piece of kit that I can highly recommend to any architecture or landscape photographer during my future camera club talks or architecture workshops. Check out my behind the scenes content above and below as well as my short video production featuring the new product both below and here over on my visual production page. Like the look of the geared head? View more about it over on the Benro website or you can simply purchase through Wex here - if you can of course, stock is already running low country wide.